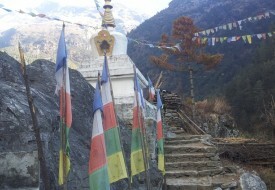 Lantang valley trek along with Ganja –la pass ( 5,122 m.) is very popular and nearest trekking from north of Kathmandu. This trek is popular for flora and fauna and pristine landscape along the way. The trip begins with driving to Shyabru Besi 1,400 m. along the rolling terrace fields, Holy Trisuli River and Langtang Khola. Migrated Tibetan People live here practicing their own beautiful culture and tradition. Side trip to Tserko Ri (5,000 m.) and Kayanging Ri (4,800 m.) Langsisa Kharka, Lriung glacier and Icefall is very attractive and amazing in this area. Trekkers can enjoy the close view of many snowcapped mountains around this valley. Old Buddhist temples and monument are found in plenty on this route. Maximum elevation in this trip is 3,800 m.
A comfortable 11 days itinerary is designed for this trek. Driving to Shyabru Besi alongside Trishuli River and rolling terrace field. People and their Culture, mountain and wildlife.